While awarding Apple's iPhone 4 its highest ratings across the board last summer, Consumer Reports is now warning users to wait, calling it "middle aged" and doubting whether Verizon will offer the unlimited data contracts it is said it would. In a blog posting, Paul Reynolds and Mike Gikas write that the Verizon iPhone 4 is "promising, but likely to be short-lived," saying that "it may be quickly replaced by a newer, cooler version more quickly than is customary even for the die-young life expectancy of most smart phones." Apple has historically rolled out a new iPhone model once each year, making the Verizon iPhone 4 a mid-year carrier expansion, not a new phone release. However, most observers expect Apple to release iPhone 5 as an update for GSM/UMTS carriers this summer, rather than aiming at replacing what will be the less than six-month old iPhone 4 on Verizon. When Apple dramatically lowered the price of the original iPhone within months of its release, it gave customers a refund in the form of a store credit, something that's nearly unheard of in the fast moving world of technology products. Other smartphone makers release new models every few months, with Motorola, for example, releasing the Droid X just months after its original Droid launched, then following up with the Droid Pro and Droid 2 models within another six months. Consumer Reports does not warn users not to buy Motorola's Droid phones because a new model will be released within six months, making its warnings about Verizon's iPhone 4 seem inconsistent. To 4G, or not to 4G? The blog posting also criticized Verizon's iPhone 4 offering as being 3G "at a time when carriersVerizon among themhave launched faster 4G networks and phones that work on them." However, while Verizon began rolling out its new "4G" LTE data network in December, it doesn't offer widespread coverage and isn't yet usable for voice calls. Additionally, the 4G phones Verizon showed at CES earlier this month aren't yet available and won't be "launched" until the middle of 2011. If Consumer Reports is worried about iPhone 4 being refreshed, it should also be warning all Verizon users to hold off buying phones because of the new batch of LTE models being offered within six months. If it starts doing that, it can continue to warn users to never buy a new smartphone because Motorola, Samsung and HTC will continue to release new and improved models every few months. Similarly, the posting complains that iPhone 4 on Verizon suffers from "CDMA's shortcomings," including an inability to use voice and data simultaneously and the lack of a global roaming option, without similarly warning that every phone on Verizon and Sprint has the same characteristics. Also highlighted as a strike against iPhone 4 is its 3.5 inch screen, "in an era where the number of smart phones with 4 inch-plus screens has swelled." 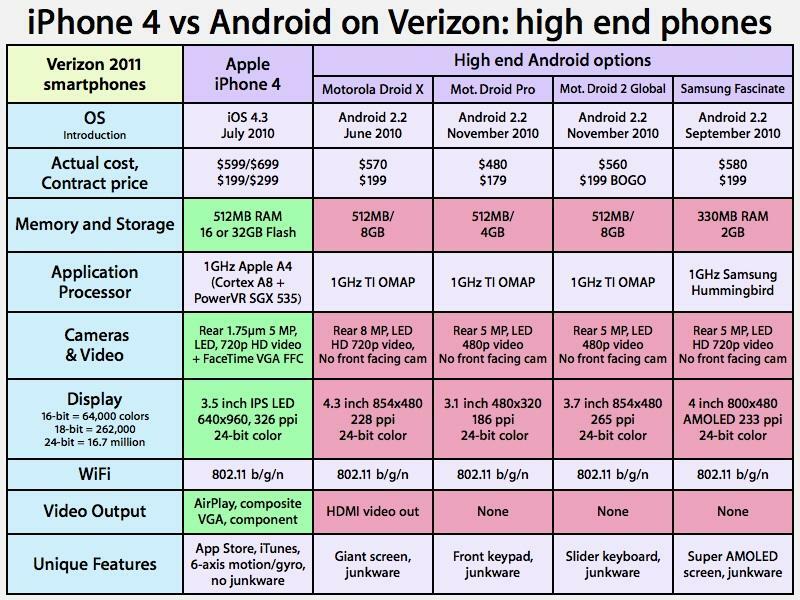 In reality, Verizon only offers two Android models with 4 inch or larger screens, the Droid X and Samsung Fascinate, although the Droid 2 is in the middle at 3.7 inches. Verizon's Droid Pro is actually smaller at just 3.1 inches, with a much lower 480x320 resolution. And of course, all of the large-screen smartphones offer far lower pixel density than iPhone 4 because they offer lower resolutions on a bigger panel. 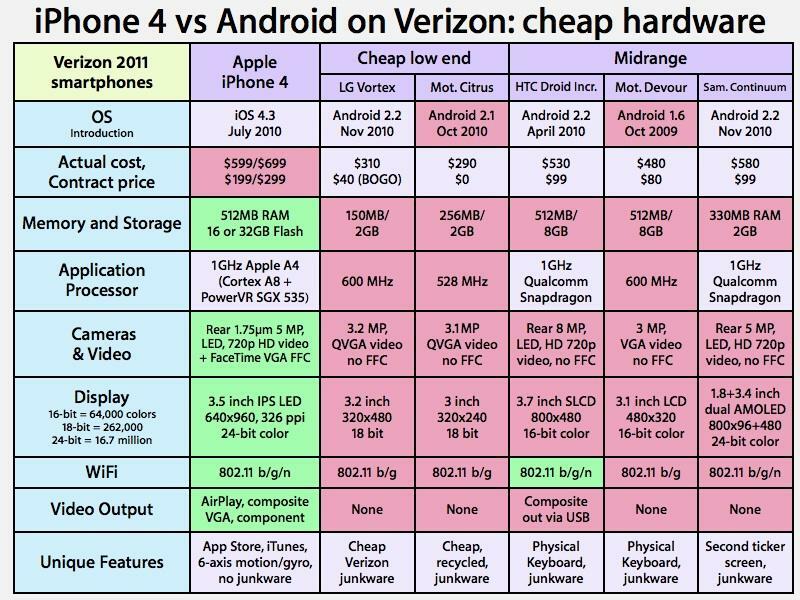 Among Verizon's mass market Android models, only one is slightly larger than iPhone 4: the HTC Droid Incredible, with a 3.7 inch screen. Other models all offer smaller screens ranging from 3 inches to 3.4 inches, and again offer lower pixel counts, some with only a quarter of the pixels of iPhone 4's Retina Display. The group also said it expects "Verizon will use the phone's launch to make its promised switch from unlimited data plans to the tiered or metered plans now used by AT&T," prevening iPhone 4 users from signing up on its unlimited data contracts. Verizon says in its iPhone 4 FAQ that "iPhone customers will need to choose from any of the current Nationwide plans. Customers will also be required to activate a data package, pricing will be announced at a later date," suggesting that the carrier is still in the process of determining whether it should charge iPhone 4 users more for the same service, or restrict them from buying unlimited contracts. "That may not necessarily mean higher costs for data than with an unlimited plan," the group wrote. "The AT&T metered plans actually lowered bills for many users, according to our analysis." It also worried whether Verizon would be able to handle the influx of new iPhone users, claiming that "some iPhone owners are data hogs, with consumption that's significantly above owners of many other smart phones." According to Verizon however, Android users actually use more data on average than iPhone users on AT&T. In language uncharacteristic of the normally objective-sounding Consumer Reports advice, even when concerning products like cars and cameras where buyers might have strong affiliations with a given brand, the posting described potential Verizon iPhone 4 adopters as "breathless" fanatics who were spendthrift and ignorant "addicts." "You may want snap up this new offering if you've been waiting breathlessly for the iPhone to come to Verizon and don't much care about 4G speed, a bigger screen, or other features found on current cutting-edge phones," wrote Reynolds and Gikas. "Or if you're prepared to pay an early termination fee to trade in the Verizon iPhone 4 for its successor when it appears. "The less iPhone-addicted consumer, on the other hand, may want to hold off for a newer version of the iPhone before even considering whether to buy one," the report concluded. The magazine's increasingly apparent lack of objectivity in smartphones began when the group embroiled itself in the Antennagate "controversy" last July. After first writing that significant signal attenuation issues could not be scientifically observed, were not unique to the new phone, and concluding that there's "no reason not to buy iPhone 4" despite the rumors about its antenna problems then being floated by Gizmodo, the group's opinion changed dramatically on the basis on non-scientific observations. Two weeks later, the company's blog posted a retraction based on videos posted on YouTube and new observations made by its bloggers, who changed their stance to say that it "can't recommend" iPhone 4 until Apple addressed their concerns with a free fix. At the same time, Consumer Reports was assigning iPhone 4 its highest rankings of all the phones it tested. Despite its official rankings obscured behind a pay wall, the group also noted that, while it refused to officially recommend the phone, "its score in our other tests placed it atop the latest ratings of smart phones that were released today." John Paczkowski of the Wall Street Journal "Digital Daily" blog noted that the site's paid evaluation rated the display, navigation, web browsing, multimedia and battery life of iPhone 4 as "excellent," gave its phoning and messaging a "very good" ranking, and described voice quality as "good." "Well this is ironic," Paczkowski wrote. "iPhone 4 is hands-down the best smartphone available today, but Consumer Reports advises against buying it." Even after Apple released free bumpers for iPhone 4 users, Consumer Reports continued to refused to officially recommend the phone, even as it did recommend models that also exhibited the same signal attenuation issues, including RIM's BlackBerry Bold 9700, HTC's Android Droid Eris, Samsung's Windows Mobile Omnia II, Nokia's N97, and Motorola's Droid X, all of which Apple included on its Smartphone Antenna Performance page.